With a rumored Jan. 27 event fast approaching, speculation regarding Apple's still-unannounced tablet continues to mount. This week, one analyst shared alleged information on the device's internal components, while another attempted to project the cost of its parts. Analyst Ashok Kumar of Northeast Securities spoke with AppleInsider this week about the device, which is expected to debut this month and ship in March. Kumar said the tablet processor will be manufactured by Samsung and will be based on the Cortex-A8 ARM architecture. He believes it will have a speed of about 1GHz. However, some have assumed that the tablet, along with the next iPhone, would be based on ARM's new Cortex-A9 architecture. The reference designs for the next-generation chip allow either two or four cores with a more power efficient design. Though Intel and its low-power, low-cost Atom processor were rumored in 2007 to be a part of Apple's forthcoming products, it never happened. Since then, it has been believed that Apple's $278 million buyout of fabless chip designer P.A. Semi would allow the company to create its own ARM-based designs for devices. Ashok also said sources have told him that the tablet will be sold in two ways: a carrier-subsidized model with a wireless data contract, and an unlocked, more expensive model not tied to a wireless provider. "They're going to have one subsidized and one direct to the consumer model," he said. Kumar also said the hardware will have a baseband supplied by Infineon, the same as in the iPhone. In November, he also told AppleInsider that a CDMA-only iPhone with a chipset from Qualcomm will be released for the Verizon network in the U.S. in 2010. He said a new dual-mode chip from Qualcomm will not be available in time for a summer 2010 launch for the new iPhone. Last fall, Kumar correctly stated that Google would release its own custom-built handset. The Nexus One was officially unveiled by Google Tuesday. However, Kumar was also criticized after he noted that iPhone sales in China were "disappointing" before the device was even on sale. Also this week, Jeffrey Fidacaro of Susquehanna Financial provided a projection of how much the internal components of Apple's tablet might cost —without even knowing for sure what they are. The details were revealed in a note to investors this week, as relayed by Fortune Brainstorm Tech. While the calculated $340 cost of components has been widely reported, that total is based on the inclusion of a 4200rpm 160GB hard disk drive. Given Apple's push for solid state drives and NAND flash memory in its mobile devices, it is unlikely that the Apple tablet would include a spinning hard drive. Fidacaro said if Apple opts for a 128GB SSD, it would add several hundred dollars to the cost of the device. The analyst also assumes the device will run on an Intel Atom processor, would include 2GB of DRAM, and sport a 3.2 megapixel camera. 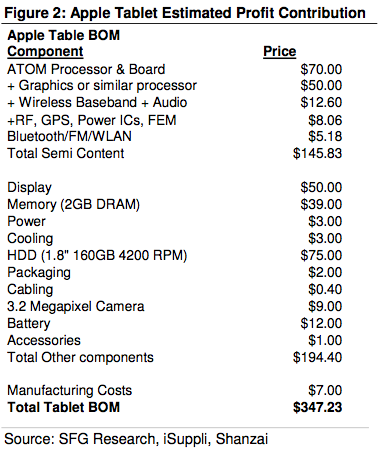 If Apple went with an ARM-based processor, Fidacaro said, the tablet's cost could be reduced by as much as $50. Apple's tablet is expected to be unveiled this month at an event on Wednesday, Jan. 27. Analysts expect it to cost less than $1,000 and to compete with both the e-book and netbook markets.